If your children are anything like mine, come autumn and the house begins to fill with conkers. But what to do with them? The girls enjoy using them in their play, however their imaginations take them: this week L’s had a class of conkers which she’s been bossing around and reading stories too! If you’d like to give the kids a blast from our childhoods, how about reminding them of the rules of playing conkers? My article over at Ready for Ten has some tips on how to pick a winning conker. And how about trying some conker weaving. 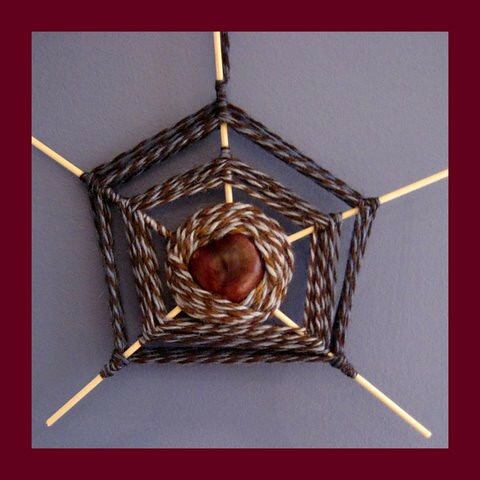 Hannah at Home Baked shared a photo of some beautiful conker webs she’d made this week. We were inspired to try some ourselves and even had a go at making conker baskets. A little fiddly for my 4 year old, but my 7 year old sat for over an hour tonight making and making and making them. Hop on over to my other blog, homemademummy if you’d like to see how ours turned out. Hi Kelli – I wonder if they’re called something different in Australia?! Oooh very pretty! Saw you tweeting about it! LOVE your end result. Like the autumn colours! I remember weaving these (without the conkers) when I was younger. The conkers make it very special! PS thanks as always for linking up!!! Hi Maggy, They’re one of my favourite things we’ve ever made. I love the mix of textures. We used to have conkers across from our house growing up (both my parents are English and they probably told us about them, but I don’t think there is a different name for them in Oz), but I can’t say I have seen them in a long time ..
Just to confirm, conkers are horse chestnuts and are not edible like regular chestnuts. I think they call them buckeyes in the USA but don’t know about Australia.